• Damselfish and anemonefish (including clownfish) are part of the family Pomacentridae, often known as the Damselfish family. • These fish tend to be small (around 6-8 cm), roughly oval and are probably the most conspicuous inhabitants of the reef. Almost all damselfishes are vibrantly coloured, especially the charismatic clownfish. 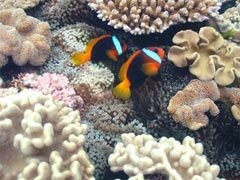 • One group, the anemonefish, have developed a symbiotic relationship with anemones and live safely in their stinging tentacles, thereby guaranteeing themselves a safe home. This group includes clownfish, made famous as Nemo. 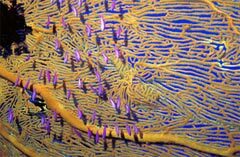 • Other groups often live near branching corals where they hide if threatened. • They feed on either plankton (small floating animals and plants in the water column) or algae. Some species have their own algal farms, which they defend zealously against intruders. • Larger fish and sharks eat damselfish although they are very good at retracting into the branches of corals if threatened. • Many damselfish can be seen caring for their eggs laid out on rocks. They hatch after 2 to 14 days. • In an anemonefish “family”, the one large female dominates the relationship and eat the most food. If she disappears or dies the male will take over her role and turn into a female, and a juvenile will become the new male. • Humans are fond of damselfish because of their attractive colours and they are often kept in aquariums.